There are two words that appear in art literature: Influence and Inspire. I have often wondered whether these words were interchangeable. Or was there a subtle difference? This question came to mind when I stepped into the National Galleries Scotland exhibition: Inspiring Impressionism: Daubigny, Monet, Van Gogh. The definition of “influence”, according to Dictionary.com is “the capacity or power of persons or things to be a compelling force on or produce effects on the actions, behavior, opinions, etc., of others. The same dictionary defines “inspire” as “to fill with an animating, quickening, or exalting influence.” Notice the inclusion of “influence” in this last description. Inspiration uses emotional appeal to open avenues of exploration and creativity. Having been influenced and inspired over the years, I have felt the delicate difference between the two, especially in the flow of artistic endeavour. 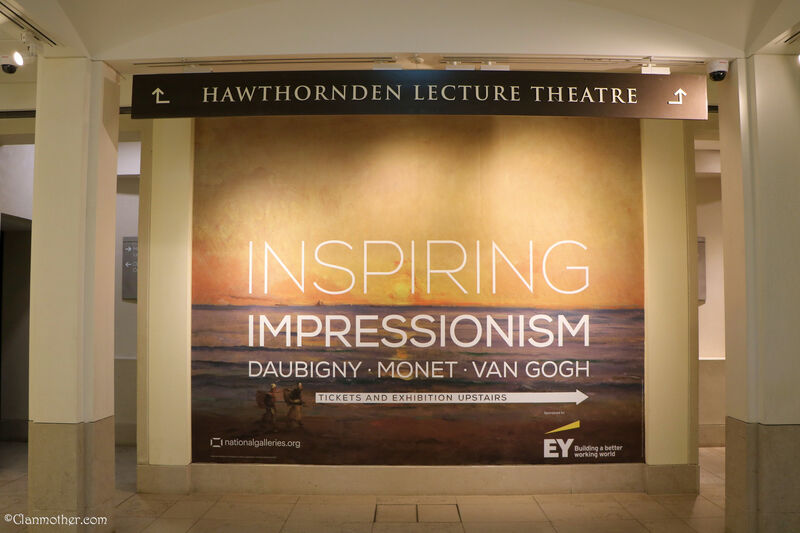 The title, Inspiring Impressionism captured the essence of the exhibition. 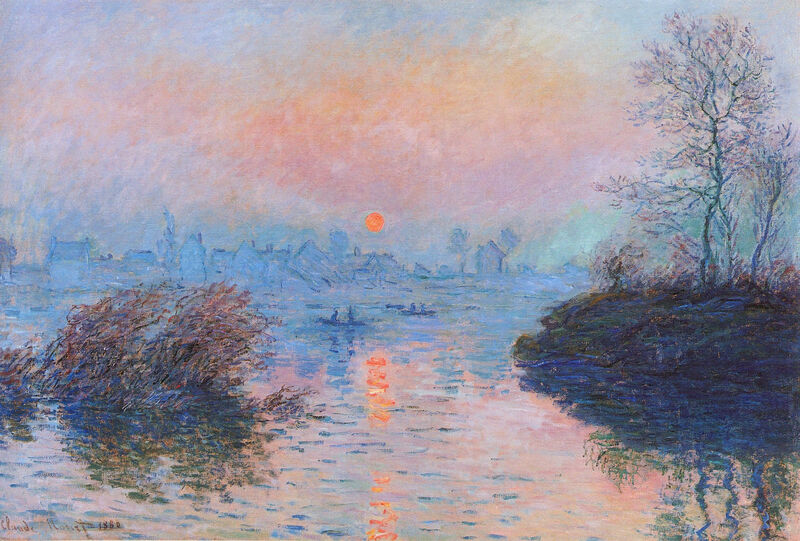 Who inspired Monet? Van Gogh? The answer: Charles François Daubigny (1817-78), one of the most important French landscape painters of the nineteenth century. (I confess I had never heard the name before, much to my chagrin.) Daubigny is considered, by some, to be the “father of Impressionism.” He painted, using a brighter pallet, preferring to remain outdoors. He travelled the Seine and Oise, positioned on his famous boat (Botin) which he turned into his art studio. I’m certain that was a novelty for that time. Inspiration brings courage, joy, hope, and yes, love, together to generate extraordinary outcomes. Daubigny inspired the young Impressionists, but he also had those who inspired him: Jean-Baptiste-Camille Corot, a French landscape and portrait painter and Jean Désiré Gustave Courbet, a French painter who led the Realist movement. A special thanks to my friend, Liz at Leaping Life for inspiring me to attend Inspiring Impressionism. Hi Rebecca: I was writing you a long message but the laptop acted up and I lost it in the cyber space. Thank you for visiting my recent posts. I saw your Assisi photos in your Portfolio. I am so thrilled! I visited Italy in Sept last year and Assisi had been my inspiration in my spiritual and artistic journey. Warm regards to you and look forward to reading more of your wonderful posts! The Impressionists are wonderful. Would like to see more of their work in future. Goodnight and have a great Friday and weekend! BTW, are you happy with Smugmug? Just curious. So good to hear from you! I have been blogging off and on over the past year as I have been involved in work projects. I keep up with reading other blogs – love this community. I have yet to really explore all of what SmugMug offers, but it seems to be user friendly. There are tutorials available and they are always updating their program. Thanks so much for stopping by – very much appreciated. Thank you Rebecca. Good luck to your work projects. I look forward to reading all your future posts again. Please keep in touch. Daubigny is pleasant news to me. The Spring Landscape is utter genius…. such beauty and wonder. Was thi one of the paintings you saw at the exhibition? It must be hypnotizing in real life! No matter how fabulous a painting is when we see it in a photo, we are never prepared to see what we see when we see it for real. How lucky you were to have gone to this exhibition. 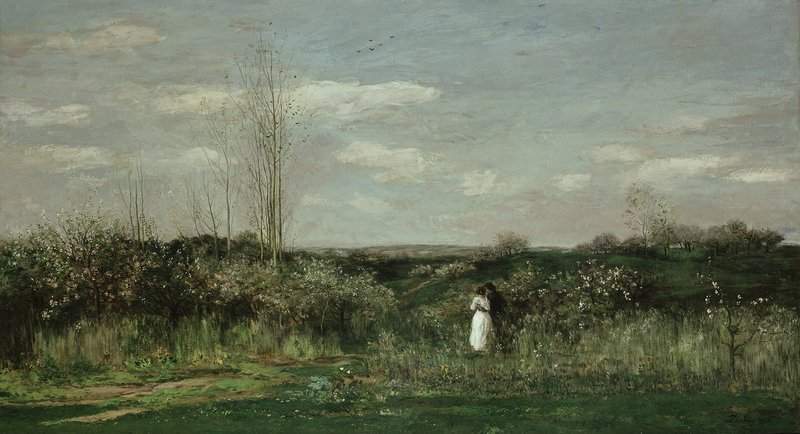 I understand that Spring Landscape is one of his largest, if not his largest painting. It is in the National Museums in Berlin, so I was unable to see it in person. Daubigny liked to complete paintings (even large ones) outside. The lighting must have given a different perspective and being closer to nature would give life to the act of painting. Wouldn’t it be wonderful to glide along the Seine in a boat and be inspired by the passing scenes. Interesting post. Funny I hadn’t thought of those two words in the context of art. Learned that dichotomy in a college class on listening. Influence = sales pitch. Inspiration = church sermon. Both valuable, but require a different part of your brain to process. Rather pleased to know that I remember something from college & that it translates so easily across disciplines. Thank you for your comments – loved the connection between influence and inspiration. I come from a business background so the definition of influence and inspiration take on a different perspective, which is more in keeping with personal achievement and mentorship. I laughed out loud when I read that you remembered something from college!! Good for you! I agree with your thoughts on translating words and ideas from one discipline to another. There is art in everything we do, whether we are in work involving sales, science, health, policy, finance, business. Creativity is not confined to those who perform magic with a paintbrush. Your comments are very much appreciated!!! You make an excellent point, Aquileana! Everyone has heard of Monet and Van Gogh, but very few know about Daubigny (including me). Monet has his garden, Van Gogh is a tragic figure – these are the narratives that resonate with people. 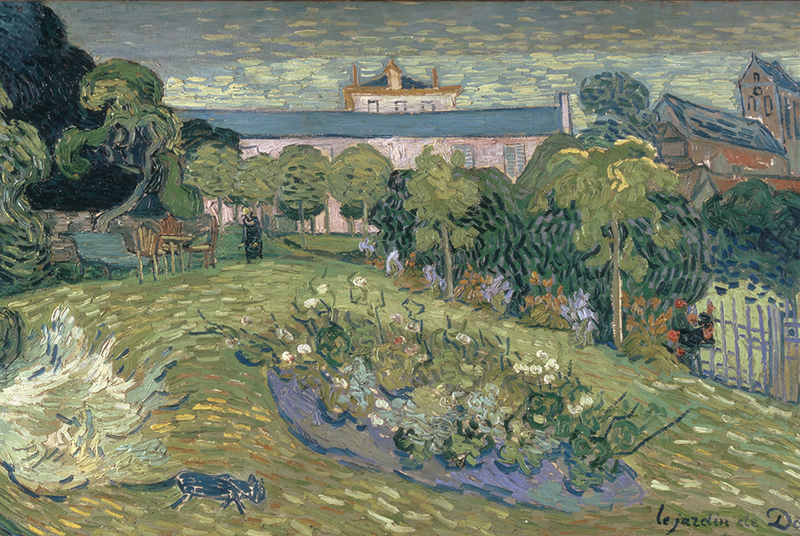 We also have Monet and Van Gogh’s writings and letters which give insight into their lives and creative endeavours. We know very little about Daubigny. These types of exhibitions are essential to preserve and celebrate lives of lesser known artists. On a related note, this is why we must continue to write – we must remember the stories of the past and record the events that occur in our lifetime. Thank you for keeping the stories alive! Many many hugs coming back your way! Thank you for your comments. This is the first I’ve heard of him. Now I will keep my eyes open for his work when I’m in France. Exceptional post! The study of art is a lifelong study and so rewarding. Such beauty! Such challenge! Such an influence to inspire! Thank you for this post; it encourages us to create our own items of beauty in our own way. Art is indeed a life-long study, which will never end simply because art is ever moving, ever changing – there is not point that art stands still. We cannot canonize creative endeavour. Art is resilient, exuberant, demanding our full participation. I find great comfort in that thought. Ein sehr interessanter lehrreicher Beitrag, dear Rebecca, kannte ich doch Daubigny auch nicht. Er war zu seiner Zeit sicher ein Freak, dass er auf einem “Hausboot” die Seine und Oise bereiste und dabei seine Sujets bequem vom Wasser her malen konnte. Toll. Ich campierte einmal vor vielen Jahren 3 Wochen lang draussen auf dem Lande am Ufer der Oise mit meiner Familie. Die Landschaft in der Natur war grossartig. Frohe Weihnachten für Sie und Ihre Familie. Ich stimme zu – Malerei von einem Boot war ungewöhnlich. Es gibt so viele Geschichten, die in der Geschichte verborgen sind. Deshalb denke ich, dass das Bloggen wichtig ist. Wir erzählen die Geschichte unserer Zeit, unserer Generation. Vielen Dank für Ihre Kommentare. Ich appeciate Ihre Ermutigung. Und danke für dein wunderbares Blog. Alles sehr sehr gut, mein lieber Freund. How wonderful and I had never heard of him either! Thank Liz for both of us. Bloggers rock! I am learning that when I view a painting, I’m seeing the influence of time, mentorship, inspiration, perseverance. We stand on the shoulders of those who come before and we are the generation that will “inspire” future endeavours. What an awesome privilege. I agree – bloggers rock!! I love being part of this amazing community.